The Astrobiology Society of Britain was enormously pleased to hold its fifth biannual conference (ASB5) at the University of Edinburgh between April 15–17 2013, coinciding with the grand opening of the newly founded UK Centre for Astrobiology at the same institution. Thus, it was hoped that the flag-ship astrobiology conference in the UK would be an ideal opportunity to forge close relationships between ASB and the UKCA. The South Hall conference venue was a perfect location for our meeting, allowing open-plan seating for the formal presentations adjacent to the poster venue site so that the 130+ attendees could mingle seamlessly between the two areas over coffee. Wednesday morning saw sessions on Life in Extreme Environments and Exoplanets & Habitability . The first of these sessions was kicked-off by an invited presentation from Andrew Clarke (British Antarctic Survey) on life under thermal stress, followed by contributed presentations from Jesse Harrison (UKCA) on mapping the boundary conditions for life and Katherine Wright (Bristol, UK) on arctic habitability as a proxy for Martian and Europan environments. The second session contained presentations on the lifetimes of habitable zones around exoplanets from Andrew Rushby (East Anglia, UK), biochemical constraints within a solar system perspective from William Bains (MIT, USA), habitable zones within Earth-like exomoons from Duncan Forgan (Edinburgh, UK) and finally Jack O’Malley-James on novel microbial biospeheres on terrestrial planets close to the end of their habitable lifetimes. 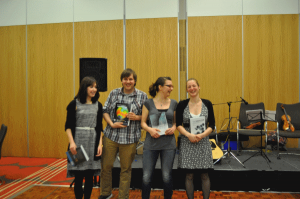 Poster prize-winners from ASB5. From L–R: Casey Bryce (University of Edinburgh), Sophie Nixon (University of Edinburgh) & Stephanie Lutz (University of Leeds), Book prizes courtesy of International Journal of Astrobiology (CUP). Photo courtesy of Naoko Nakatsuka, National Institute of Polar Research, Japan. The afternoon session began with and ESA & ELIPS wherein Rene Demets (ESA) discussed the European Life & Physical Sciences in Space (ELIPS) programme and how the UK (a new partner in ELIPS) could contribute. The following session on Molecules and the Origins of Life brought us two invited speakers, Lorna Dougan (University of Leeds) presented some of her recent work using atomic force microscopy to probe protein un-winding whilst Robert Pascal (Université de Montpelier) emphasised the need to provide a constrained thermodynamic environment to understanding self-organisation. The final session of the day, focusing on session on Life in Extreme Environments, contained an invited talk by David Holmes (Centre for Bioinformatics and Genome Biology, Chile) on iron biogeochemistry within acidic environments followed by supporting seminars from Vern Pheonix (Glasgow, UK) on the preservation of molecular life-signatures on the Bolivian Altiplano regolith and Claire Cousins (Birkbeck & UKCA) on bacterial & archaeal communities within the sub-glacial Kverkfjöll volcano, Iceland. Michaela Musilova (Bristol, UK) brought day one to a close with a description of organic matter production within simulated glacier surface environments. A superb first day was then capped by a cultural journey along some of the whisky and gin routes of Scotland, several of those routes being trod multiple times! Thursday morning started with a bang as Lynn Rothschild (NASA Ames Research Center, USA), delivered a special lecture on how synthetic biology may help us in solar system colonization. This was followed by sessions devoted to Mars and Mars-analogue Environments where Sam Kouvanes (Tufts, USA), Mark Claire (St Andrew’s, UK) and Alex Pontefract (Western Ontario, Canada) took us through new results from the Pheonix landing site, Antarctic Dry valleys, Martina meteorite EETA79001, the Atacama desert and habitat creation via impact cratering. Subsequently, Gerda Horneck (DLR, Germany) took us through the 40 year history of astrobiology in earth orbit. A further two sessions entitled: Extremes & Astrobiology and Instrumentation & Mars Missions saw a range of presentations from Mark Burchell (Kent, UK), John Parnell (Aberdeen, UK) and Jessica Stromberg (Western Ontario, Canada) on hypervelocity impacts, lithological interfaces in deep biosphere habitats and sub-seafloor hydrothermal systems respectively in the former. The latter session contained presentations from Richard Ingley (Leicester, UK), Samantha Rolfe (OU, UK) and Jennifer Harris (Birkbeck, UK) on analytical methods (including Raman and multispectral in situ imaging) for Mars missions. This brought to a close the formal programme for our second day but, just prior to dispersing to prepare for the evenings social highlight, a short ASB open forum session allowed questions on astrobiology within the UK and Europe to be put to a panel composed of Terry Kee (President, ASB), Andrew Kuh (UK Space Agency) and Gerda Horneck (President, EANA). Several positive suggestions for future collaboration and directions were received which will be reviewed within ASB over the coming months. Finally, the evening concluded with a superb hot buffet conference dinner, prize-giving to our three poster winners (see photo below) and a lively ceilidh to top off the evening. Friday morning was far from a low-key affair as a packed auditorium listened to Lewis Dartnell (UCL) on the persistence time of prebiotic organics and biosignatures on Mars. A session on Hydrocarbons & Extraterrestrial Environments afforded us an invited talk from Dirk Schulze-Makuch (Washington State, USA) on the diversity of microbial life within one of the very few terrestrial asphalt pools, this one in Pitch Lake, La Brea, Trinidad. Further talks from Lucy Norman (UCL) on reverse vesicle formation under Titan-like environments, Paul Rimmer (St. Andrews) on cosmic-ray induced chemistry and Jeremy Kua (Yale-NUS) discussing computational analyses of the formaldehyde oligomerisation process. Our final session, on the topic of Extreme Environments, Analogue Environments and Biomolecules , brought our final pair of invited talks. Jenn Biddle (Delaware, USA) outlined the potential for learning about extraterrestrials by exploring intraterrestrials whilst Gordon Osinki (Western Ontario, Canada) took us through how meteoritic impact craters could be considered an extreme environment for life. This fifth ASB meeting has continued a fine tradition and built upon it seamlessly. With more than 130 delegates, 35 oral presentations and over 45 posters, this year’s meeting has been the largest and most international in flavour such ASB meeting to date and bodes well for the vibrancy and interconnectivity of UK astrobiology. Hopefully, ASB6 in 2015 will build upon this year’s success. A huge vote of thanks must go to Charles Cockell and his team at the UK Centre for Astrobiology in Edinburgh for bringing all the key strands of ASB5 together, Jesse Harrison, Derek Martin, Sophie L Nixon, Sam Payler, Sarah Brown, Mark Fox-Powell, Casey Bryce & Claire Cousins for superb local organisation. In addition, our thanks go to all ASB members who came along to support our flag-ship meeting and to our sponsors, the UK Space Agency, the Royal Astronomical Society, the UKCA and International Journal of Astrobiology & CUP and finally the Centre for Science at Extreme Conditions, University of Edinburgh.